Applying infrared tracking to a projection surface, Magic Projection makes digital visuals more immersive by freeing the content from fixed real-world imagery. We saw the project at the end of last year, but technologist and magician Marco Tempest tells us he’s just completed the first live performance debut of the system. The project is built in OpenFrameworks, with the assistance of that project’s founder Zach Lieberman. 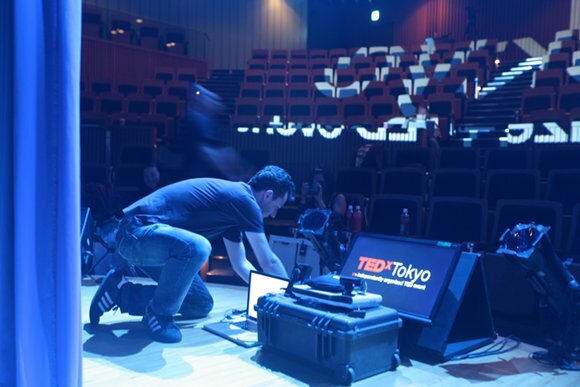 Here is the first ever live performance with my Magic Projection system (at TEDxTokyo 2010). Have fun watching and let me know what you think. Special Thanks to: Zachary Lieberman for his programing wizardry, Animation Cell for bringing Stickman to life, Jojo Mayer for the soundtrack, Makiko Oku for helping me with my Japanese, Empire Entertainment Japan for all their support and to Patrick Newell and the gang at TEDxTokyo for having me as a guest. A super special shout out to all people creating amazing free tools available to artists everywhere: OpenFrameworks, [open computer vision framework] OpenCV, [free Mac video driver implementation] MacCam. I am performing on May 23 at 5 pm and will give some explanations on how the software and hardware works. If someone makes it in Japan, do send us a report back!